← The Ditibiwebishkiganikwe is in! Shifting Gears is all about passing it forward. When the snow hit last Friday and the Peoples bike clinic was postponed I took the opportunity to unite Natalie Gille with her “new” bicycle. The Trek 730 Multitrack was purchased at the Home Place many years ago by a family in Bagley. The bike was gently used and well maintained but lately has sat neglected in a garage while the owners pursue the joys of riding new recumbent bicycles and trikes in their retirement. When they heard about Shifting Gears this winter they decided to donate the bike to the cause. Enter Natalie. I met her at a Bike Bemidji event last fall. She is a refugee from the financial industry and urban life who decided to return to college at BSU and redefine herself as an “environmental leader”. (Check out her blog, The Striped Pedaler.) 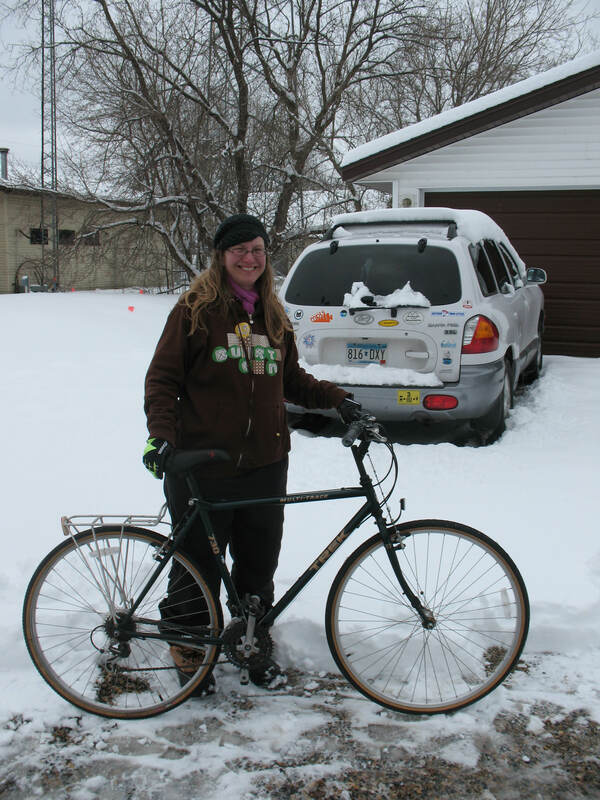 She emailed me a few weeks ago requesting some help with her bicycle as she is explores the feasibility of a bicycle messenger service in Bemidji. We met over food at the Wild Hare and I was impressed with her commitment and clear headed approach to starting a new environmentally sound small business in our community. Her mountain bike was stolen some time ago and she had been riding a borrowed bike with serious brake issues. Furthermore the rear wheel of this bike had recently disgorged its ball bearings all over the garage floor. She brought it out to the shop and we worked together to replace the wheel, cables, and housing and managed to get the beast back in riding condition. While we succeeded in getting it working it is definitely not the fast, reliable, well fitting bike required by a bicycle messenger. I had her try out the Trek and it fit perfectly! 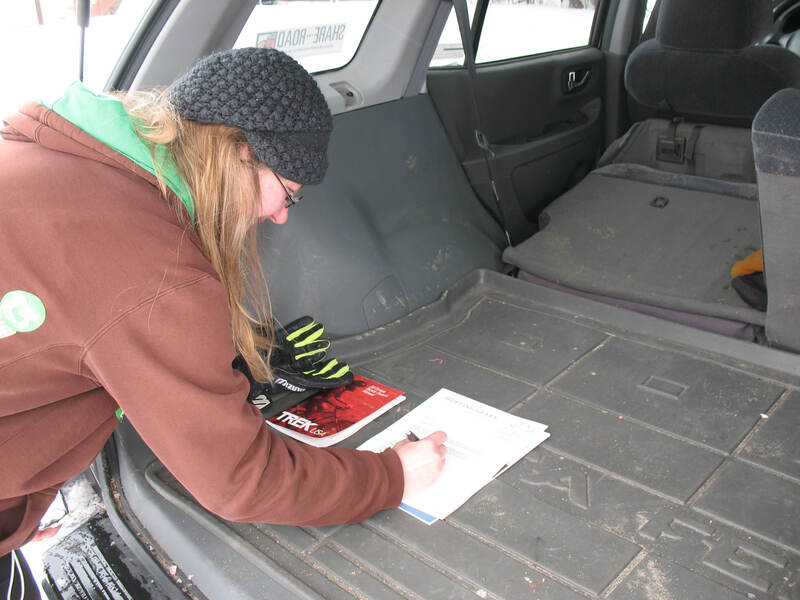 Natalie signs her Pass It Forward contract. Natalie will embark on her business venture riding a “new” bike and in exchange she will use her newly acquired bicycle repair skills to help others at Shifting Gears clinics and Bike Bemidji events over the course of the summer. So when you see Natalie this summer delivering items for local businesses wearing her trademark striped socks think about what you might do to pass forward the good things that others have done for you. And on this Earth Day weekend think about passing it forward to Mother Earth by leaving your car at home and riding your bike to work or to do the shopping. It’s fun, it’s healthy, it’s clean, it’s economical, and it will help us pass forward a better environment for our children. The earth will thank you for it.